The first time I tried nutella was in France, on my honeymoon. I thought French kids were the luckiest people on earth. There was no way my mom would have given me a chocolate hazelnut spread on anything. (For the record it was the 1960s, she was a hippy and didn’t allow any sugar at all. Hence my full on sugar rebellion and career as a pastry chef.) French kids get nutella for breakfast, on their bread at lunch or as a late night snack. They all seemed healthy enough, so I think the French moms are on to something. My honeymoon was 23 years ago and in the meantime we Americans have had a hazelnut spread revolution of our own. Now you can find it on the shelves of Costco and 7-eleven. My house is never without a jar. 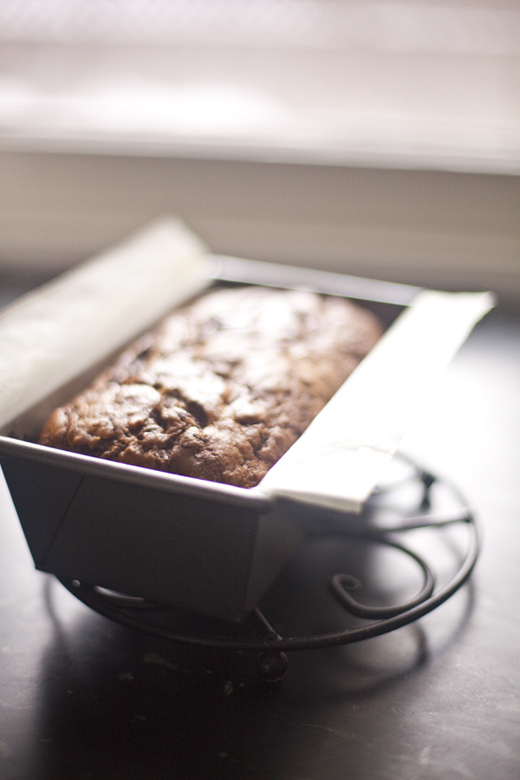 I’ve spread nutella on just about everything, but one of my favorites is freshly baked banana bread. In an “aha! 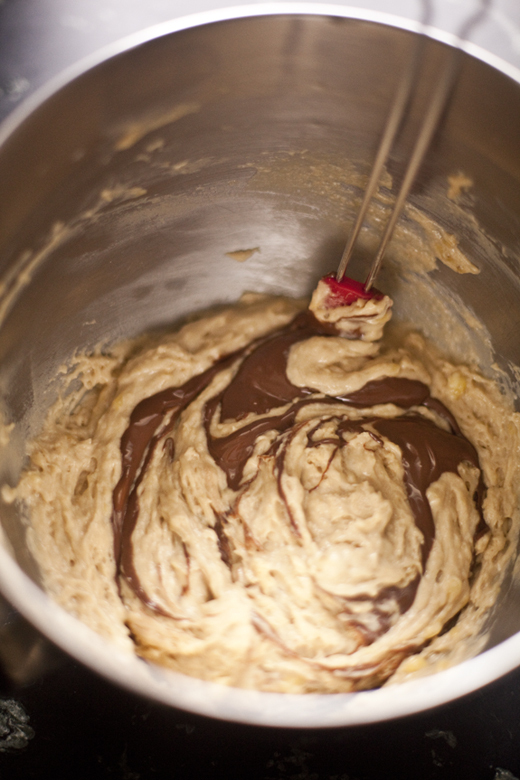 moment” I decided to swirl the nutella right into the batter and bake them together. I’m not claiming to have discovered this combo, but I believe this may be the tastiest pairing ever there was. 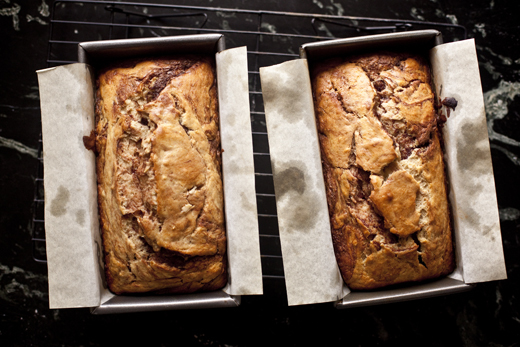 I now always make two loaves of nutella swirled banana bread, otherwise it disappears too quickly. One we eat while it is still warm and a bit gooey, the other sits for breakfast the next day. It is magnificent and super simple to make. This is a short video I made with Craftsy on this recipe. In the video I only make one loaf, but I always bake two! Preaheat oven to 350°F. 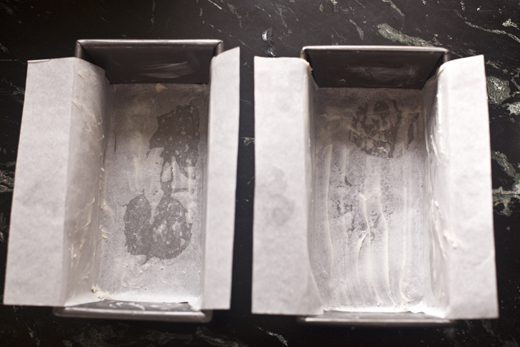 Grease two Loaf Pans (8.5 x 4.5 x 2-3/4-Inches) with butter, lined with buttered parchment. 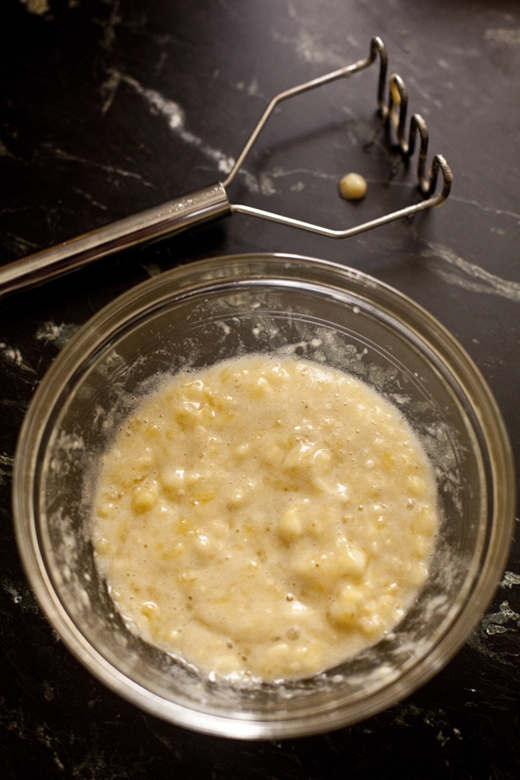 Mash the bananas with a Potato Masher, so they still have some small lumps, set aside. In a stand mixer fitted with the paddle attachment, combine the sugar, butter, milk, eggs and vanilla. 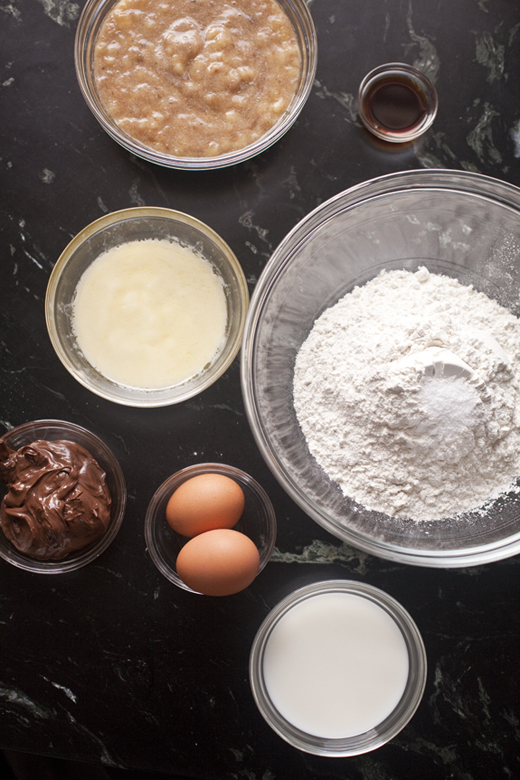 Whisk together the flour, baking powder, baking soda and salt. Add the dry ingredients to the sugar/butter mixture, just until smooth. Add the bananas and mix just until they are combined. 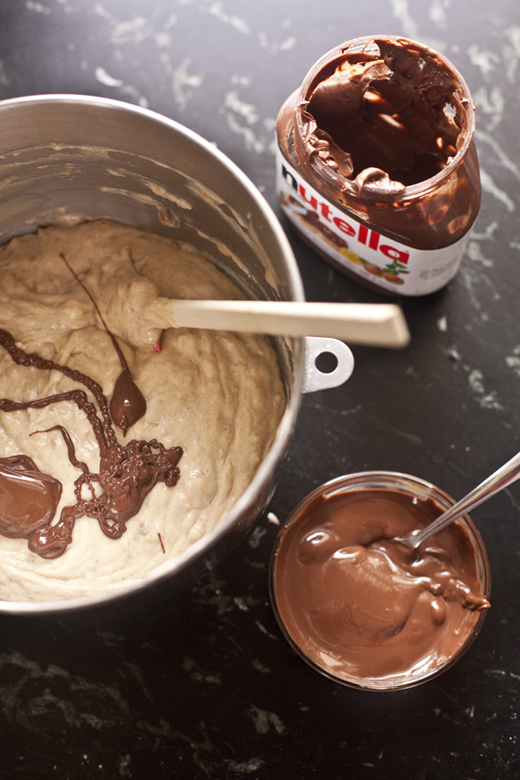 Heat the nutella in a microwave for about 20 seconds to soften it. If you don’t use a microwave, you can heat the nutella over a double boiler for a couple of minutes. 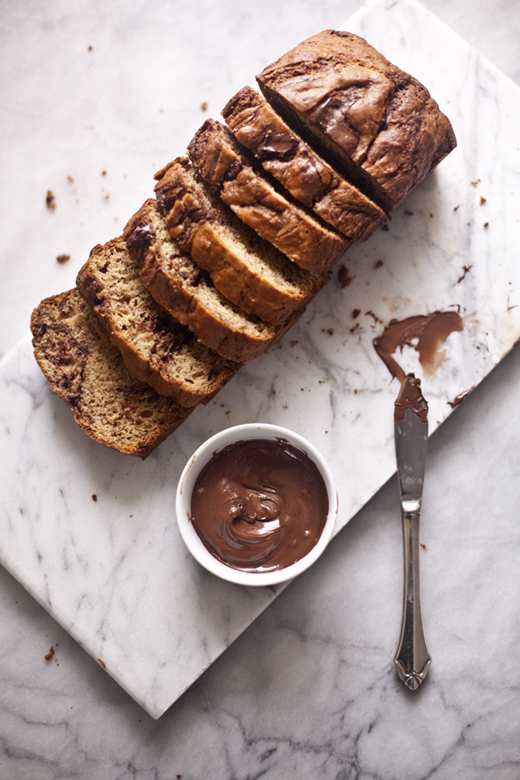 Drizzle 2/3 of the nutella over the banana bread batter. Using a rubber spatula gently fold the nutella into the batter, trying not to over mix, so you can see the swirls when it is baked. 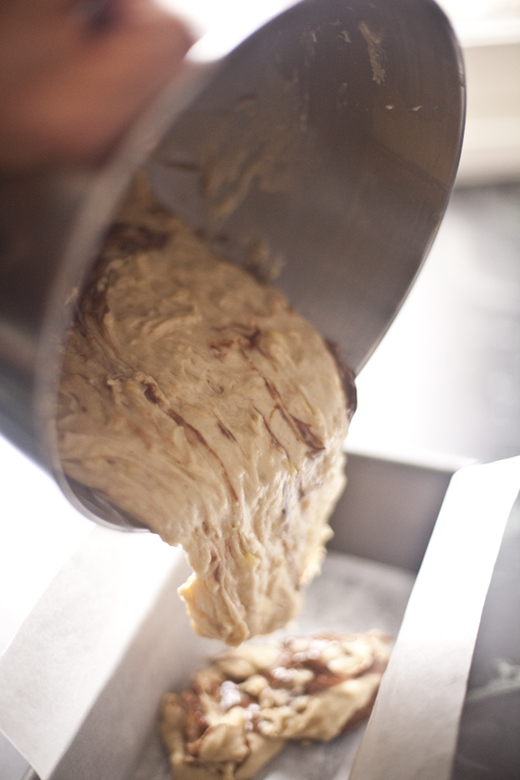 Carefully divide the batter into the pans, trying not to overly mix the batter, so the swirls stay well defined. 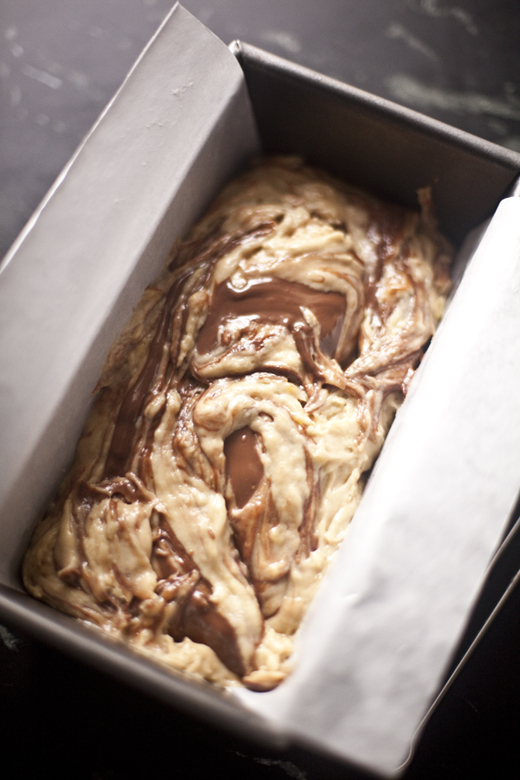 Add the rest of the nutella and swirl into the batter. Bake for about 45 mintues or until a tester comes out clean. Allow to cool in pan for about 10 mintues. Remove and eat one of them while it is still warm and gooey. 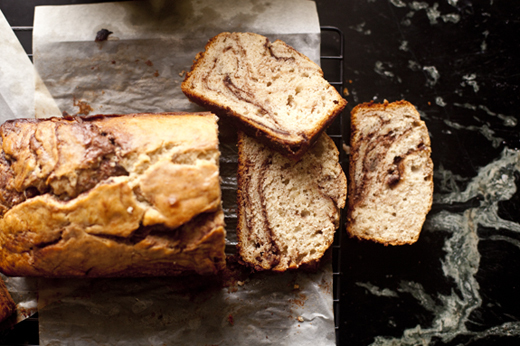 Save the other nutella swirled banana bread for the next day and serve with more melted nutella. 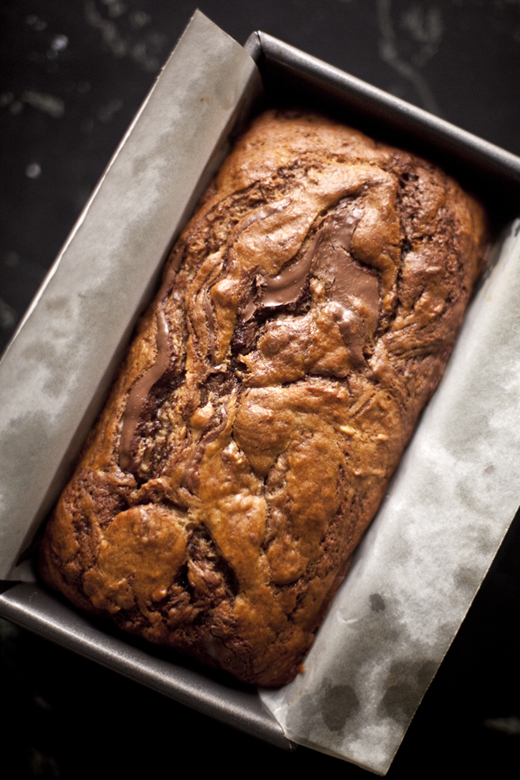 I love this banana bread, who could say no to a Nutella swirl?! I rarely make the same recipe twice, since there are just so many to get through in one lifetime, but I find myself making this one a lot! Yummmm!! 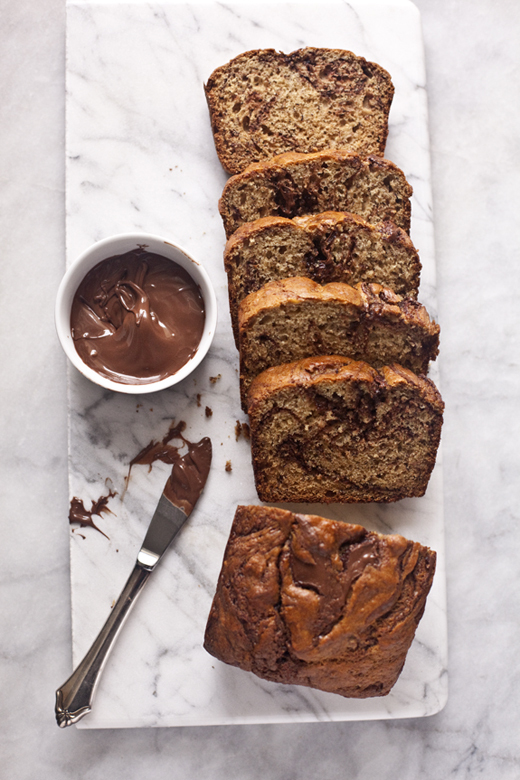 I love adding a swirl of Nutella to banana bread! This recipe looks great! I have never had Nutella! time to try it because I love banana bread. I actually first discovered Nutella, or a chocolate hazelnut spread, in Israel when I was 17 and went nuts for it. But same as you, it just didn’t exist in the States back then. Now I really find it too sweet for my liking – at least the jarred kind – but pairing it with a banana bread is both genius (it tames the sweetness while bringing out the chocolate) and perfect (I always put mini chocolate chips in my banana bread). My family will love this! Yours is gorgeous as usual. Have you made your own? I think it is a worthwhile endeavor and then it would be much less sweet. I agree, I can’t eat it on its own or I find it cloying. Oh YUM! High five Zoe! I don’t know if you remember me, but we’ve met a couple times. Once when I took a class from you and the last time was when you hosted Deb Perleman in MSP for her book tour visit. I was the red haired girl who sat right next to you in the library w/my Husband and when you sat down I reintroduced myself? Anyways, I was really hoping to get your opinion on something…. I’ve narrowed my range/oven down to either a Wolf 60″ All Gas Range or the 48″ Dual Fuel. My question since I know you bake so much and I really enjoy baking is: Do you think baking in an electric convection oven is better than baking in an all gas oven? The Wolf DF electric oven has 2 fans and they say is a “true” convection because the heating elements come f/behind the fans. Whereas the gas oven is just a singe fan that blows. Also wondering if you think having 2 regular size all gas ovens would be more useable than having the 1 30″ oven along w/an 18″ companion that would be both electric convection? Both would have gas cooktops. I love to bake pie, scones, bread, cookies and I have actually called our local bakeries and asked the bakers what they use and most said they bake in all gas ovens! (Rustica, Patisserie 46, Cafe Latte) but I’ve heard for home kitchens that electric convection is better for baking. So I’m conflicted and since I know you just remodeled your own kitchen if you would have an opinion on this? We are in the process of planning a new home in Grand Marais, MN and so this will be my forever kitchen! Any help or thoughts would be greatly appreciated! Thank you! Gas is wonderful, but unless you have steam injectors you will be happier baking bread in an electric oven. I find most gas ovens, including Wolf, are made in such a way that they don’t trap steam, which is essential for baking bread. I have electric ovens and am about to get the new electric wall ovens from BlueStar. The bluestar is 30″ wide, but can fit a full sized sheet pan, which is great. I don’t think I’d find an 18″ oven very useful, but you may? Thanks so much for your reply and insight! I had a feeling I would be happier with an electric oven since that’s what I use now and have never owned a gas oven. Only considered a gas because they cost much less than a Dual Fuel Electric range and it would have been two 30″ ovens for the price of the DF. I did not know that Blue Star had electric ovens, maybe because we are only looking at ranges and I am not sure we’ll have room for a 48″ + a wall oven, which would be ideal! We are just a two person household so thought the small oven might come in handy at times…..might have to check out Blue Star again. Thanks again for your honest opinion from a baking standpoint and for helping confirm my decision! I really appreciate it!!! Let me know what you go with. The BlueStar electric oven comes out soon, but I think you are right and it will only be wall ovens at first. That is one seriously gorgeous loaf. Two of my most favorite things in one. Love, love.. I think I need to move to France after I hear that! So good. It may just be that the Nutella was a bit thick in spots. If you melt it and drizzle it in a thinner stream it may help. I have never made banana bread before (new to baking, here) but my husband loves Nutella so I thought I’d give it a try. It was very good but I thought it was just a tad dry. Any tips on how to moisten it up just a bit? Just found this recipe and would like to try it as I was very disappointed with the New York Times recipe for Nutella banana bread. Your recipe looks delicious! Would it work with small loaf pans? Thank you! This bread is amazing! Easy to put together and delish. Another commenter said it was dry – not at all for me! But I did weigh my bananas out of curiosity and I needed 6 instead of 4 FYI. I had a bunch of bananas in the freezer to use so I did just defrost and use those. Excellent recipe – thank you!